After the death of their parents, twins Alexander and Selene and younger brother Ptolemy are in a dangerous position, left to the mercy of their father's greatest rival, Octavian Caesar. However, Caesar does not kill them as expected, but takes the trio to Rome to be paraded as part of his triumphant return and to demonstrate his solidified power. As the twins adapt to life in Rome in the inner circle of Caesar's family, they grow into adulthood ensconced in a web of secrecy, intrigue and constant danger. Told from Selene's perspective, the tale draws readers into the fascinating world of ancient Rome and into the court of Rome's first and most famous emperor. 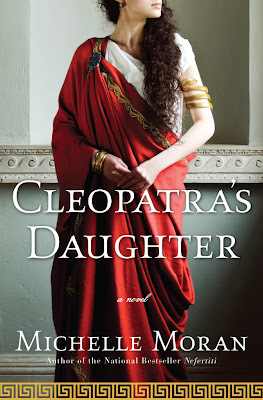 There were some things I really enjoyed about Cleopatra's Daughter, but there were some elements that really didn't work for me. It was kind of a mixed bag, in my opinion, but I may just not have been in the right frame of mind when I read it. It took me a long time to get in to this book. I'm not very familiar with Egyptian or Roman history, so I was really confused at a lot of the name-dropping. There are so many characters - and so many conversations where they refer to people while also trying to subtly explain who they are. It was all a little too much for me. There were also some moments that seemed really unrealistic too me. The twins get settled in to their new life and city awfully fast, especially having such a heartbreaking and traumatic past. It made them seem less like real characters because they often didn't react in a way that made sense. Some of the historical element didn't fit in organically. For example, details were added in to conversations for the sake of the reader and felt sort of clunky. That made the reading experience a little less enjoyable for me. Don't get me wrong - I was obviously interested enough to finish the story. But as someone who typically loves historical fiction, this wasn't quite as nuanced as I expected it to be. Having said that, I did enjoy the Red Eagle storyline and the mystery surrounding his/her identity. If you approach this book just expecting an interesting story, I think you'll enjoy it. If you're looking for fiction that is really rooted in history and seems accurate, this probably isn't for you. I love the cover. And that quote. SO true. Great review. I love the cover, too! It's what attracted me to the book in the first place :) And thank you! I've never heard of this book - at least I don't think I have. The cover is just stunningly beautiful, though, and I really love Roman and Egyptian history and mythology so I could see myself possibly enjoying it if I took the time to read it. On the other hand, it's interesting what you mention in your last sentence or two - I am not the *biggest* lover of historical fiction, but when I do read it, I do want it to be accurate or I will spend more time annoyed than actually enjoying the story. Great review, Hannah! I was so torn on this book. On the one hand, I loved the cover and really liked a lot of the story. However, at the same time, I did feel like I was drawn out of the story by the feeling that things didn't seem quite right. I'm not an expert of Roman or Egyptian history by any means, but I still felt like something was a little off at times in this. I'll be interested in your thoughts if you ever do read it.